So, you are coming to Valencia. Great. We are sure you’re going to have an amazing time in the city. Finding the perfect accommodation is not piece of cake especially when you have so many offers but you want to make sure that the apartment is exactly the way you want it. 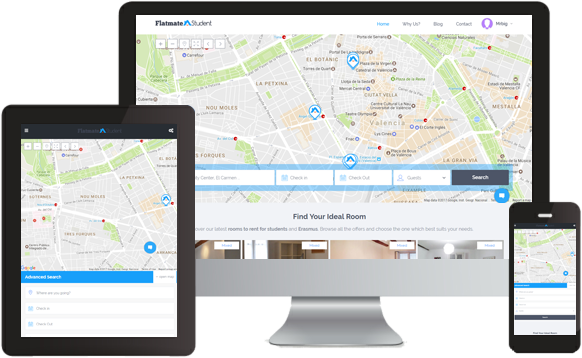 In Home page you may use the Search Bar to browse for rooms based on the location you are interested in or the arrival date. Please note that Flatmate Student only allows 30 days of minimum booking starting the 1st day of the month. On the results page you can filter the rooms according to your needs and choose one for more details. Now that you have chosen the right room, select the check in and check out dates and send the booking request. You’ll have to be logged in to book a room or register for free if you don’t have an account. Once the request is sent, you’ll recive the confirmation and you’ll be contacted for more details about the long term booking procedures. Remember to check your user account for booking status and messages from the owner.